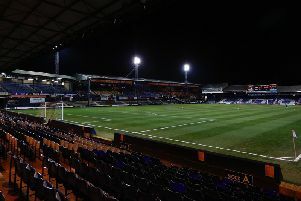 Patience was the watchword for Luton boss Mick Harford after his side picked up a 2-0 win over Rochdale at Kenilworth Road on Saturday. The hosts had to wait until the 59th minute to break the deadlock, when Danny Hylton headed home from close range after seeing his shot saved and then Elliot Lee's header hit the bar. James Collins’ 20th of the season in stoppage time ended any element of doubt over the destination of the three points as speaking afterwards, Harford said: “That is the key word, in all fairness, ‘patience’. “We had to be patient, they were compact, had a back five, people sat in front of the back four and we had to be patient, keep the ball moving, move the ball quickly. The Hatters definitely weren’t without their opportunities, Collins and Hylton narrowly off target in the first half, while both Mpanzu and Elliot Lee were denied by fine saves from Andy Lonergan after the break, with Jack Stacey clean through as well. Harford continued: “Their keeper played well, he made two or three good saves, while Jack was just about to set himself to shoot and he (Joe Bunney) got a great challenge in. “There were numerous occasions when we could have scored, but we’re happy we kept a clean sheet. “Defensively we looked sound, James (Shea) really didn’t have a lot to do, maybe a little scramble in the first half.